Hey guys! This week has been a bit crazy for me, to say the least. It is currently Ann Arbor Restaurant Week (June 9-14, 2013 – tomorrow’s the last day!). I was sad that I wasn’t going to get to partake in Restaurant Week this summer, but I found time to grab dinner downtown with the huz tonight, and we made a great restaurant choice by going to Marnee Thai! 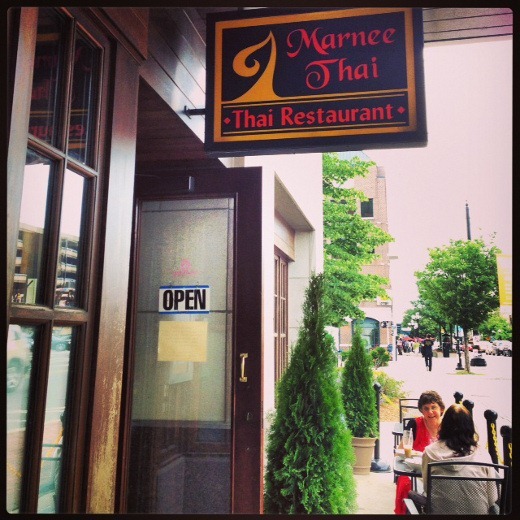 You might remember that we (and the huz, especially), have had a hankering for Marnee Thai ever since we served as judges at Taste of Ann Arbor and tried some if their delicious food and drink for the first time in quite a while. Tonight we remedied that that hankering. 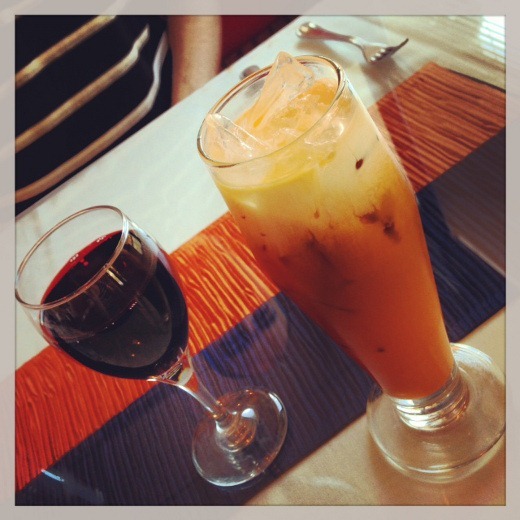 Malbec for me, and sinfully indulgent and divine Thai iced tea for him (and sips stolen by me). 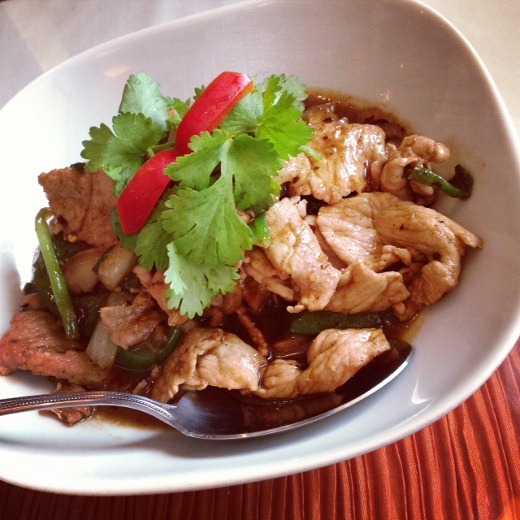 One of the big draws of Marnee Thai during Restaurant Week is that they offer the dinner for two for $28 which is half the price of many other area restaurants – and a terrific deal. To start, we picked an appetizer to share. 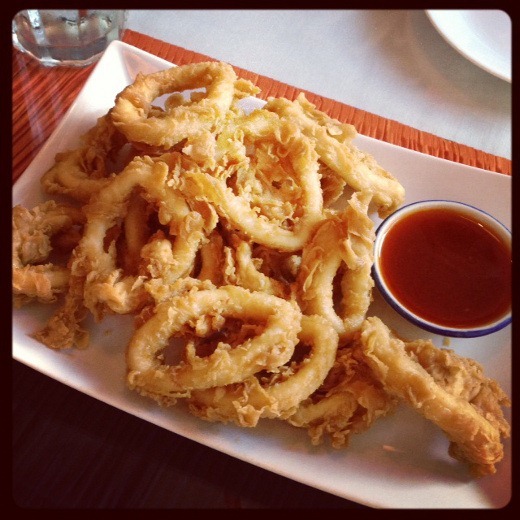 When we see calamari on a menu, we find it hard to resist. The Sriracha-based dipping sauce had a good deal of heat and flavor that I enjoyed. Manager, Kurt, kindly recommended some dishes from the Restaurant Week menu for us, and at his recommendation, I ordered the Pad Ped. PERFECT choice! This was one of those dishes that made me be that annoying person exclaiming “OhEmGee, this is soooo good” after every bite. Because it was! Pad Ped is a red curry stir fry, sautéed with spicy red curry, basil, rhizome and bell pepper. Diners may choose their desired heat level for each dish (mild, medium, hot), and for this dish, a protein may also be chosen (beef, chicken, pork or jumbo shrimp). My dish arrived piping hot and smelled amazingly fragrant. The scent of warm curry spices made my mouth water. I ordered my Pad Ped with chicken at a medium heat level and it was absolutely delicious. The sauce was so very thick, rich, and flavorful, and I could certainly detect the heat – perfection! Crave-able. I highly recommend this dish and suspect it will likely be my new go-to dish when I come back (though it’s hard to resist trying other items on the menu!). Pad Prig, a spicy stir fry, with a choice of beef, chicken, pork or jumbo shrimp sautéed with Thai chili, onion, green onion, mushroom, bell pepper and oyster sauce, was the huz’s choice. He also selected a medium heat level, with pork as his protein. I also loved this dish! The sauce was fantastic and the pork was tender and flavorful (and usually I’m not a big pork fan). I was especially a big fan of all the mushrooms in this dish. The huz’s favorite of the two dishes was the one he ordered (Pad Prig), and my favorite of the two dishes was the one I ordered (Pad Ped), so that worked out well – though we did share a bit! I should also mention that we received a generous bowl of rice with our entrées. For dessert, Marnee Thai has recognized the desire of many patrons to finish their meals with a more traditional chocolate American dessert by offering yummy sweets like chocolate cake and tuxedo cheesecake. 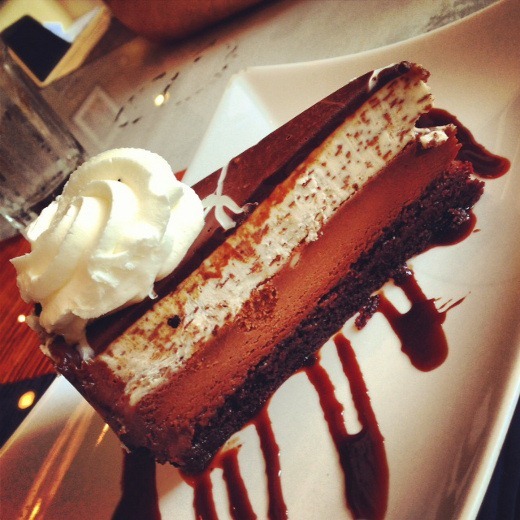 We ordered the latter, which offered a trifecta of chocolate-y goodness. The huz said this dish reminded him of hot chocolate. 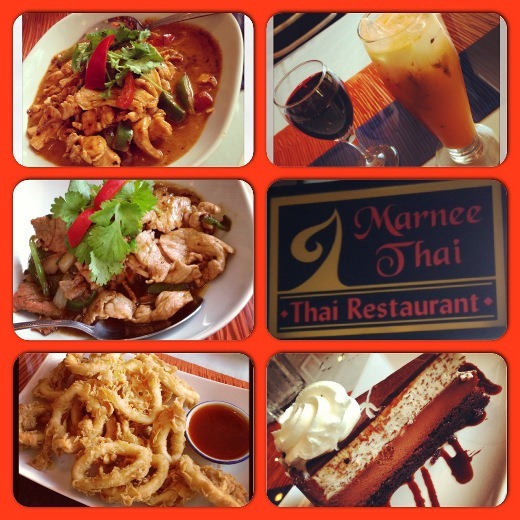 All in all we had a really fantastic dining experience at Marnee Thai this evening! All of the food we ordered was wonderful, with our two entrées being the standouts. The restaurant was fairly crowded, since it was Restaurant Week, but our service was attentive throughout our meal. 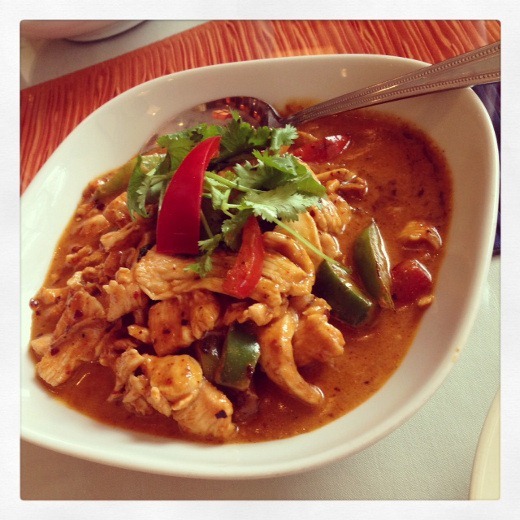 I can’t wait to return for more Thai cuisine! Pingback: Dinner Meal Plan for June 16-22 | Meg.Goes.Nom.Nom.